As a self-titled creative whirlwind, I maintain a very interesting artistic journey. I feel the urge to create something new almost every day, yet my interests shift between various colors, mediums, and ideas so quickly that I can barely keep up. Three weeks ago I was sewing my own clothes, two weeks ago, I was crocheting, last week I was painting, this week I am hand lettering, next week… who knows? Creating something new always feels invigorating to me, almost frantic. I begin with a very brief glimmer of an idea and then proceed, allowing the art to form as it will. I move quickly, so excited to see what the finished piece will look like. I enjoy the process, obviously, but when creating I tend to love the product even more. I could stare at my work for hours, trying to see it through new eyes– just as I can easily spend a day or more speaking with artists at arts markets, delving into the details of their working process. I become their biggest fan. 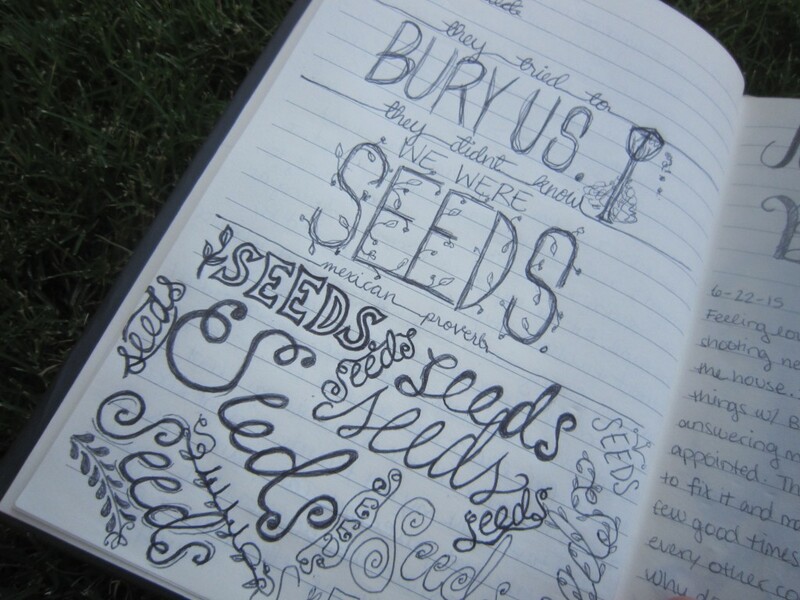 This week, hand lettering is really speaking to my creativity. I search instagram for hours, finding artist after artist, reading a myriad of beautifully-lettered quotes, taking note of letter forms and color combinations and piece composition. 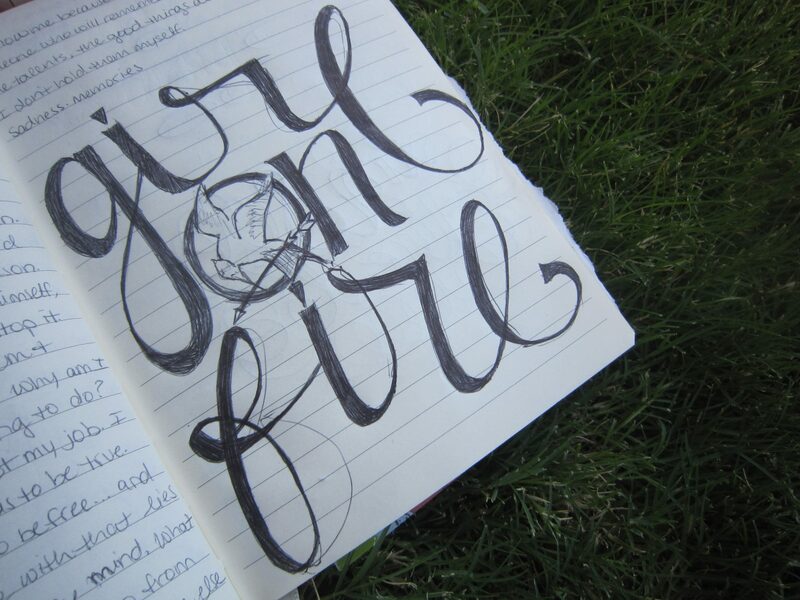 Then, the pen goes to paper and I begin sketching out ideas, practicing letters, imagining word layouts. Hand lettering brings together several of my favorite things: beautiful fonts, beautiful phrases, and the artistic combination of pen strokes, color, and form. Plus, it’s super fun! Especially when the internet is covered with artists engaging in such pursuits daily. Our world is full of inspiration. Jenny Highsmith’s #letteritjuly Challenge: Jenny creates a list of phrases to letter, one for each day of the month, and causes a massive ripple effect of artists all over the internet posting their creations. It’s a wonderful community full of varying levels of skill and experience. I love seeing what everyone comes up with each day! This hashtag makes for the ultimate instagram search when it comes to hand lettering. Megan Wells on alisaburke.com: I have always loved following Alisa Burke’s amazing creative blog. 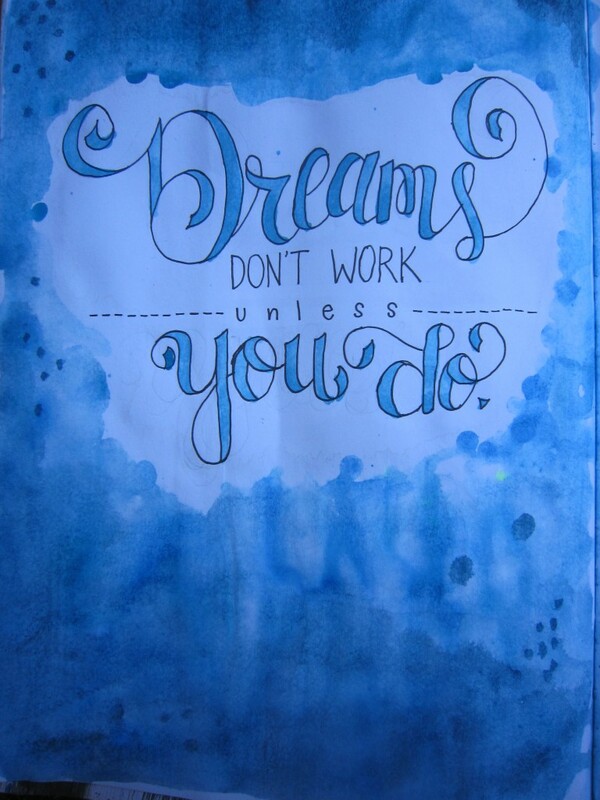 She invited the lovely Megan Wells (see her full blog here) to publish a series of posts on hand lettering, which has given me and other creative-types a slew of artist eye-candy. The first few posts in the series are great tutorials for anyone looking to start lettering as a beginner. Check out the introduction here. The spin-off hashtag for this series is #redefinecreativelettering in case you’re feeling curious! 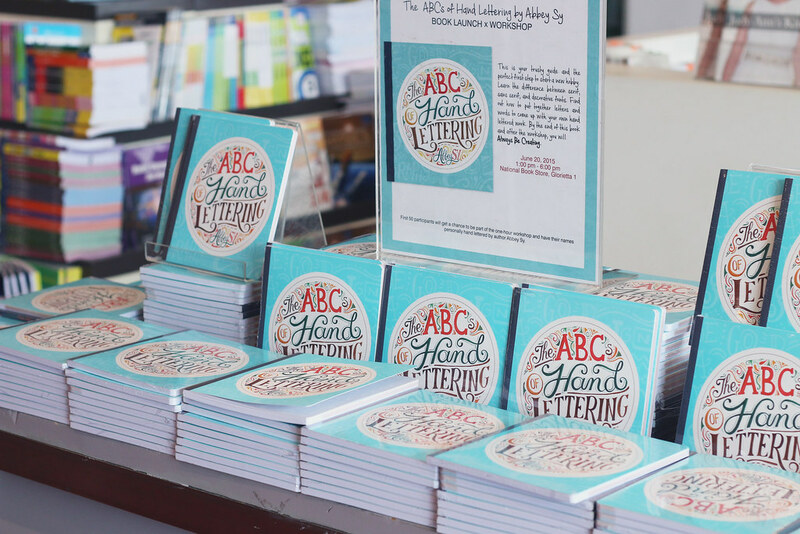 The ABCs of Hand Lettering by Abbey Sy: You know I am always up for checking out a new book! Even with the awesomeness that is youtube, I still refer to published books first in order to hone a new craft. Something about being able to flip the pages and lay them out in front of my work space really helps with my learning process. I haven’t yet received my copy of this new book. 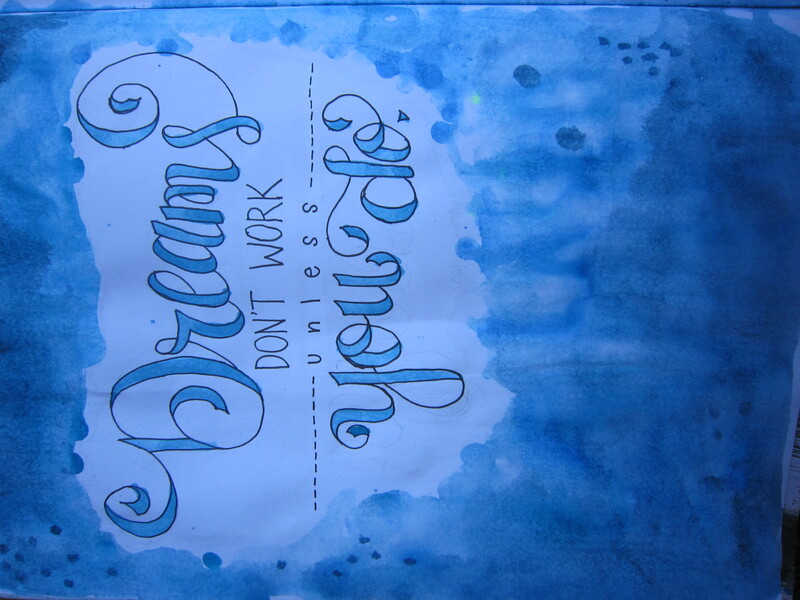 However, Abbey’s lettering has always inspired me, and her entire blog is full of lettered goodies to view! She also has good featured posts on other lettering books as well as her favorite supplies for hand lettering. No wonder they always complain about being bored… their minds are so limited to screens and programmed activity that they have no idea how to live. I am so incredibly thankful that my childhood was not that way. I am so thankful that I was always provided with paper and supplies to create treasure maps, artistic masterpieces, and self portraits. I was so blessed to exercise that part of my brain early in my life. Today, I hope you take a moment to engage in some creative pursuit. I hope that you enjoy bringing a little bit of your inner self out into the world, for all of us (or even just you) to appreciate. 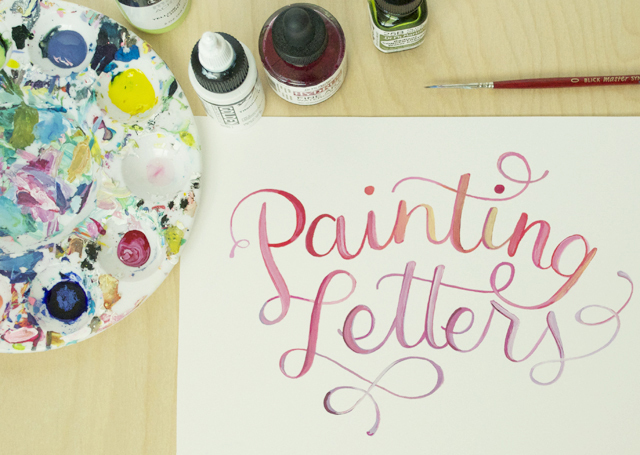 Whether it’s watercolor, play dough, fondant, or hand lettering… express your ideas today. 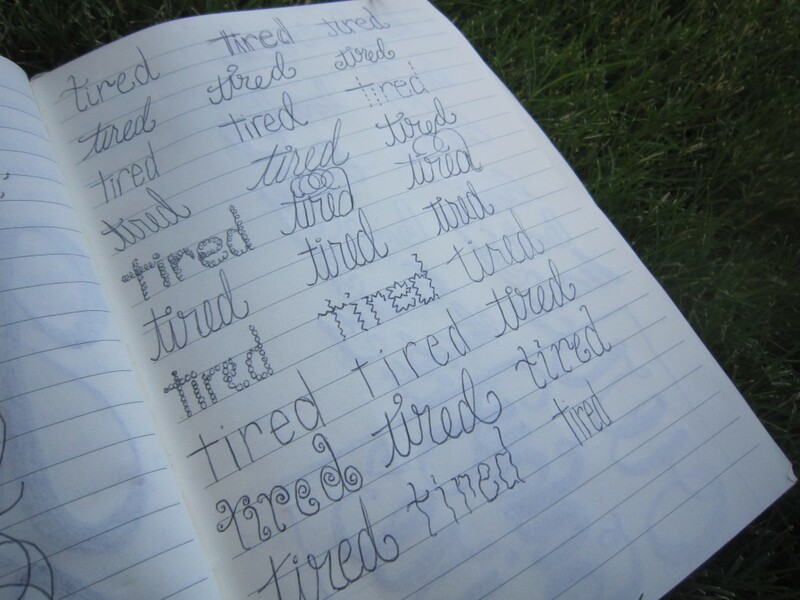 You have described entirely how I am. I was always wandering if I was alone in this world. Now I know that I am not, that there are millions of creative people out there like myself, felling the necessity to create. Thank you. I’m so happy you have found a kindred spirit! I hope you’re giving attention to your creative self today. 🙂 Thank you for writing! It’s so nice to know there are other dear souls out there with me in the blogosphere!